Designation: Surgical Registrar, University Hospital Kerry, Tralee. List of Author(s): Soomro N, Hamdy A. Copyright: © 2018 Soomro N, et al. This is an openaccess article distributed under the terms of the Creative Commons Attribution License, which permits unrestricted use, distribution, and reproduction in any medium, provided the original author and source are credited. A subhepatic appendicitis is very rare and may cause a surgical dilemma. Majority of cases are associated with malrotation of bowel. Our case highlights how an 18cm appendix had the tip placed subhepatic and was acutely inflamed. We have gone through the diagnosis, relevance of imaging and timely surgical management. Case report, Appendix, Diagnostic Mystery. The average length of an appendix in a human is 9 centimeters (cm), with a range of between 2 to 20 cm. The most common positions are descending intraperitoneal (31%-74%) and retrocecal (26%-65%) . Given the variability in length and position the clinical presentation of acute appendicitis may vary significantly. The first description of appendicitis was in 1886  since then the morbidity and mortality has markedly reduced. Since Willard Packard perform first surgery in 1867 , appendectomy remains one of the most common surgical emergencies. Sub hepatic appendix where described in 1955 by Allen King  and may occur due a malrotation of the gut. In a study of 7,210 patients, subhepatic appendicitis was found in 0.08% of cases . Therefore, a subhepatic appendicitis may present as an acute diagnostic dilemma. A 57-year-old obese male presented to the hospital with complains of sudden onset of severe right renal angle and right upper quadrant pain for 2 days. Associated with low grade pyrexia, anorexia, two episodes of vomiting and burning micturition. He had a background history of Chronic Obstructive Pulmonary Disease(COPD), hypertension, pyelonephritis and spleen conserving surgery 20 years ago. Vitals were stable and on examination there was marked tenderness in right renal angle and right upper quadrant and epigastrium. On palpating the right iliac fossa, had mild discomfort. He did not illicit Rosving sign, rebound or obturator or psoas sign. Blood investigations revealed a white blood cell (WBC) of 9 g/dl and C-reactive protein (CRP) of 102. The remaining test and examination were unremarkable. He underwent a computed tomography (CT) of the abdomen and pelvis which revealed a retrocecal, subhepatic acute appendicitis. No other acute pathology. Patient was taken to theatre for a laparoscopic appendectomy after informed consent. Four ports were required, the extra port made in upper abdomen to access tip of appendix. Intra-operative, the base of appendix was visualized. A careful and blunt dissection was required to find the tip of the appendix. The tip was found to be covered by the liver and inflamed and oedematous. It was adherent below the right lobe of the liver and stuck to the hepatic flexure. Meticulous dissection of tip of appendix was performed Figure 1 and appendix taken out. Before placing in formalin for histology it measured 18cm in length. On the histology report it was 16cm and acute suppurative appendicitis. Post-operative course was unremarkable and discharge after 48 hours of intravenous antibiotic. a- Long appendix in instrument. b- Tip of appendix adherent to liver. c- After resection of appendix of liver. d- Appendicular stump. Figure 1: a- Long appendix in instrument. b- Tip of appendix adherent to liver. c- After resection of appendix of liver. d- Appendicular stump. Although the most common general surgical emergency is acute appendicitis. Given the variation in size and location it may cause a diagnostic dilemma. The rare instance that the appendix is sub hepatic may often delay the diagnosis. As the differential diagnosis of either pathology related to gallbladder, liver or kidney may be raised. This is where imaging plays a crucial role. The overall lifetime occurrence is approximately 12 % in men and 25 % in women [6-8]. Imaging has reduced the number of negative appendicectomy and helped in the diagnosis of difficult cases. Ultrasound or CT scan is used for complex cases and helpful for diagnosis and clarification. An article from 2010 shows a decrease in negative appendectomy from 23% to 1.7% . Following algorithm illustrated in Figure 2 is a useful roadmap . Choice of surgical approach may vary according to experience of surgeon, facilities, and available equipment. Algorithm for the management of suspected appendicitis. 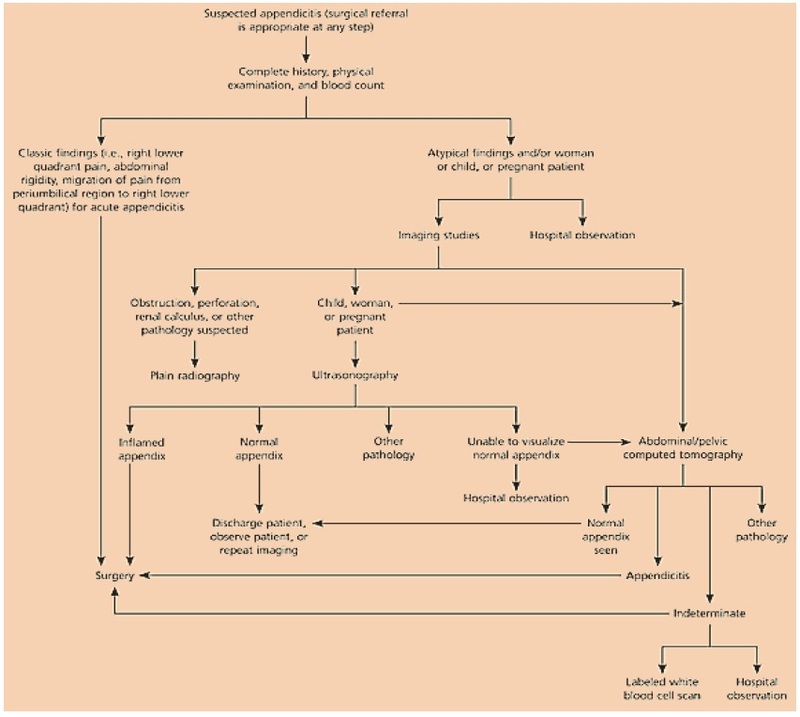 Figure 2: Algorithm for the management of suspected appendicitis. In conclusion, a high index of suspicion is required for atypical appendicitis, imaging is not only useful but crucial in these cases.